Kanye West was "encouraging" on his Vogue shoot with Kim Kardashian, but insisted on being involved in his fiancee's look. 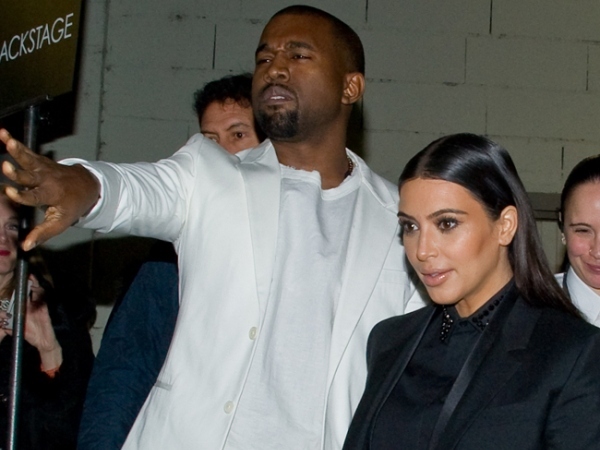 Kanye West helped decide what Kim Kardashian would wear for their Vogue shoot. The Bound 2 hitmaker - who famously overhauled the reality TV star's wardrobe months after they started dating in 2012 - advised on his fiancée’s make-up and outfits, but in an "encouraging", rather than critical way. Make-up artist Aaron de May, who worked on the shoot, said: "He thought that her make-up looked very beautiful, but definitely had opinions on the dresses and the styles he liked best, but it was in a supportive way ; it was lovely to see them interact with each other." Kim - who wore a series of bridal-style gowns in the shoot for the iconic publication and Kanye were also photographed with their nine-month-old daughter North, and Aaron wanted the Keeping Up with the Kardashians star to seem "realistic" in the family pictures, so kept her make-up fairly simple. He explained to Cosmopolitan.com: "She was very open to something different, but Grace [Coddington] wanted to simplify her look because Kim is naturally gorgeous. Grace also had couture dresses made for her that were very sophisticated and ladylike, so we wanted to keep her look fresh and young -- almost like a twist on the style. Plus, she had the baby and Kanye with her in the pictures, so I wanted her to look realistic and not too untouchable."